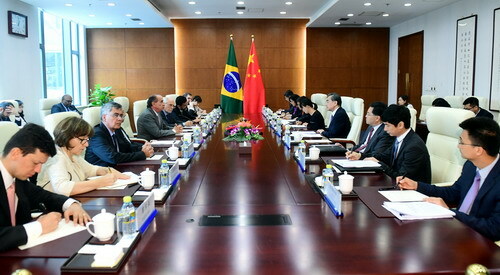 On May 15, 2018, State Councilor and Foreign Minister Wang Yi met with Foreign Minister Aloysio Nunes of Brazil in Beijing. Wang Yi expressed that under the current international situation, cooperation between China and Brazil, the largest developing countries respectively in the eastern and western hemispheres, enjoys strong vitality and broad prospects for development. President Xi Jinping has put forward the “Belt and Road” initiative, and Brazil has been actively pushing forward the Investment Partnerships Program and other development strategies. The two countries could achieve equal integration, deepen practical cooperation in various fields, and better benefit the two peoples through extensive consultation, joint contribution and shared benefits. Brazil has significant influence in the Latin American region, and the two countries should jointly promote the cooperation between China and the Latin American region, strengthen communication and coordination within the Forum of China and the Community of Latin American and Caribbean States, the BRICS countries, the G20, the United Nations and other international multilateral mechanisms, deepen strategic mutual trust, unity and cooperation, and jointly maintain multilateralism, economic globalization and free trade, so as to safeguard the legitimate rights and interests of developing countries. 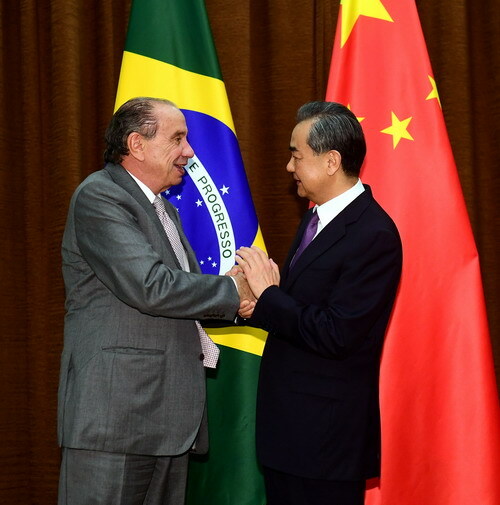 Aloysio Nunes expressed that no matter how the future political situation develops, Brazil will always uphold its friendship toward China, and always consider developing its relations with China as a priority of its diplomacy. The Brazilian side has been actively researching the integration between the “Belt and Road” initiative and its own development strategies, which will bring new connotations to bilateral cooperation, and is a good deed with mutual benefit and win-win results. China has been promoting its cooperation with Latin American countries in line with the principles of equality, mutual benefit and non-interference in domestic affairs, and has become a true partner acknowledged by all Latin American countries. The Brazilian side stands ready to, together with China, constantly expand strategic consensus and common interests, strengthen cooperation and coordination within multilateral mechanisms, jointly safeguard multilateralism and oppose trade protectionism.